I've been cracking on with my winter project, my tramway. Before starting on the new board, I've had a big push to finish of the one I started last winter. 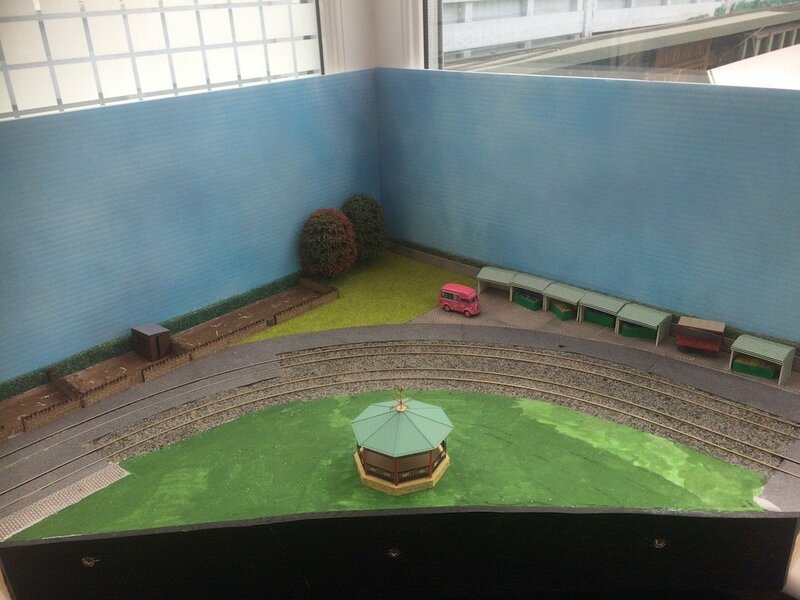 It is a corner board with a bandstand on the inside, and allotments, pinic area and market stalls on the outside of the tracks. This is how it's looked through 2016. The first job was to add a building as a tea and coffee bar. The Metcalfe cricket pavilion fitted the job, and the space. I also put together the Metcalfe pub tables I'd bought last year. A couple of low relief tree finished off the back corner. I wanted a tarmac path around the band stand. I would have used Metcalfe card sheets, which the roadways are made of, but I had run out. Instead I used a cereal box and aerosol paint. I needed to do some careful cutting to get the path to fit the landscape as the bandstand sits atop a small rise. I am pleased with the result. I used acrylic window sealant in the flowerbeds. I was going to flock the grass between the bandstand and the tracks, until a mate pointed out that a grass mat would be better. I'd run out of grass mat so bought a new one. He was right, it went down a treat and really looks the part. I'd also got to work on the allotments working on the greenhouse, pigeon loft raised bed etc. 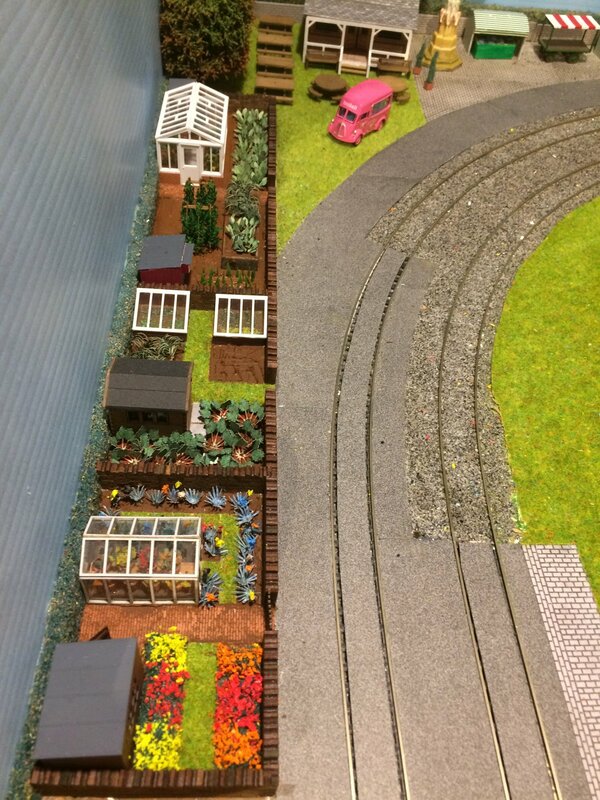 With most of the elements for the allotments made it was time to plant everything in the scene. Lots more brown acrylic sealant was applied to create soil and hold things in place. Noch laser cut plants are used for the veg. The runner beans are Busch. Today I finished the allotments off and planted the flower beds. 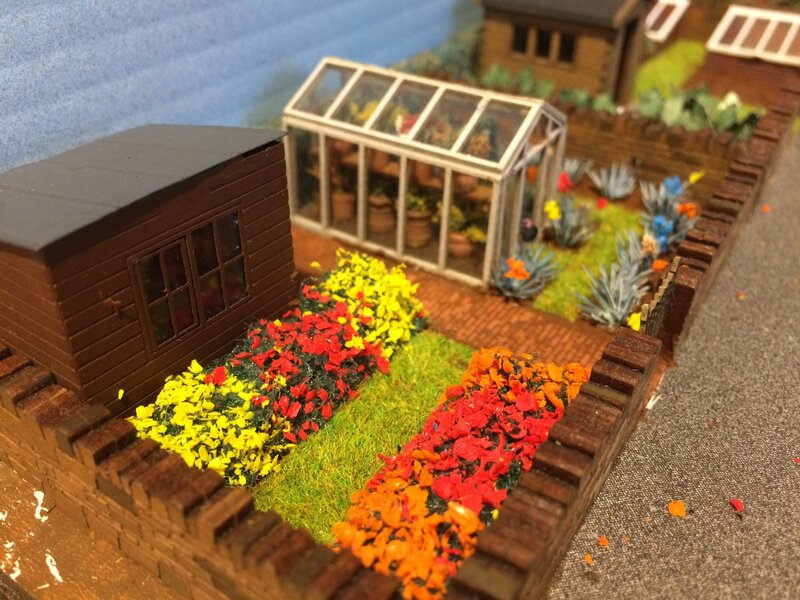 The flower beds were mainly made with pan scrubs and grated wax crayons (the purple bits were from Woodland scenics). The tulips are Noch, but I added a flake or two of wax crayon to improve the look. There are a few more jobs to do. I will add gates to the allotments. Buildings need to be glued down. The market stalls require items to sell. It needs to be peopled. The final job will be to add the overhead. This has to be done last because it really gets in the way of doing everything once it is installed. Lovely work Chris and very well detailed. You should be very pleased with what you've achieved. The sealant makes a convincing soil and I'd never have guessed at wax crayons. It's amazing what you can come up with given just a little thought. And this is the board you started last year so you have another still to do? Yes Mick, I've done some preliminary work on board 4. My attention should switch over to that in the next couple of days. And if you think that they wax crayons were imaginative then my first posting on board 4 will blow your mind. Wonderful work, someone must like their rhubarb!!! A quick update on my tramway. I built a fairground on a return loop baseboard. I'd built the baseboard and track last winter, so back in December I pushed on to complete the scenery. I spray pained cardboard for the tarmac areas and used metcalfe papers from the cobbles. Wet and dray paper for the crushed stone/cinder paths. There has been some further "dressing" of the scene. But I still need to put the overhead in on this board. Here are some other pics from the other areas of the Tramway. I have done some more dressing work since t here photos were taken. It's now all packed away in the loft so as not to distract me from my summer homies in the garden. My tramway has relocated from the loft to the conservatory, a sure sign summer is over. I'm taking to my coffee shop on Saturday along with a couple of other layouts to entertain the regulars. I came across an interesting issue with the tramway this week. The reversing loop has a DCC reverser circuitboard wired to a short length of track. I's decided on a length slightly longer than my longest tram, a twin bogie 8 wheeler. This short section was required because trams can follow each other round, unlike trains which are kept apart by signals. I needed to avoid the situation where one tram was entering the reversing section of track while another tram was leaving it and a short section seemed like the best option. That was until this week when a friend brought round his modern Blackpool Flexity tram. This is a 3 bogie, 12 wheeler and it's about twice as long as my short section of reversing track! I may have to rewire the board so the entire return loop baseboard is run through the reverser circuitboard to allow my mates tram to run. That said, the quick test we did, which stopped short of the reversing section, showed that the Flexity wasn't that flexible and it derailed on my 8 inch curves. I'll have to take it apart and see if I can make any adjustments to it so it can snake around my tramway. Hi Chris, is this another layout to your HOn30 layout, I like your air grounds and your street, are those building full kits. Keep the good work up and great to have another layout to run when it is too cold to venture out side, it is too dam hot here, cool change coming in next week happens every year when the kids go back to school, need the rain badly. Yes Tony, this is a OO tramway. It's DCC which enables prototypical operation. I've sorted the issues with the Flexity. Awhile DCCing it I made it more flexible so it now goes around the tight bends OK. Much really sure how I did this. I've also rewired the reversing loop to include a switch which allows the section of revering track to be electrically extended so it's longer then the Felxity. That said. I haven't done a test run yet.